Sign-ups are being accepted for the fourth annual James Nelson Memorial golf tournament fundraiser presented by the Wood River Baseball and Softball Association (WRBSA). The Nelson Memorial will begin Saturday, May 17 at 1 p.m. at The Valley Club. Check-in takes place at noon. Proceeds will benefit the WRBSA as well as the Zachary and Andrew Nelson College Fund. Cost is $150 per golfer or $560 per team, which is the same as last year. The fee includes 18 holes of golf with cart, appetizers and no-host bar following play. Non-golfers for $10 can join the group after the golf for appetizers and the no-host bar. There will be a raffle and silent auction. Silver Creek Auto is once again sponsoring a hole-in-one prize for a car. Last year, there was a winner. To register call Buffy Brunker at 720-1998, email mikebuffy@gmail.com, or call Bonnie Burrell 720-1695 or email bonburrell@gmail.com. He was the youngest brother of five boys plus four sisters in Ray and Marian Nelson’s Hailey family that founded the Ray Nelson Little League baseball tournament in the early 1970s. 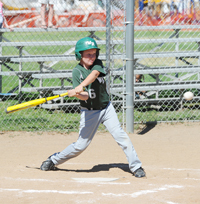 The Nelson family has been involved in local youth baseball development at every level.